A Liberal's Libretto: Seance on a Wet Afternoon. So... how did it go? Seance on a Wet Afternoon. So... how did it go? In crafting his first opera, Seance on a Wet Afternoon, Stephen Schwartz combines everything he knows about Broadway songwriting and Hollywood scoring -- which is plenty -- with a lyrical streak rarely seen from the composer of Wicked, Pippin and Godspell. Those gifts beautifully serve this quirkily Freudian ghost story about a psychic's uncertain relationship with the material world. Opera Santa Barbara's commissioned premiere production doesn't bring out the work's full potential, but it's terrifically involving and entertaining, sure to excite the interest of opera impresarios (and maybe even legit ones) seeking new audiences for a rigorous art form. For more from Variety - including Bob Verini's discussion on "transitions reminiscent of Bernard Herrmann with Hitchcock -- nervous, violent pizzicati or great, thumping chords from the underworld." - read the full Variety review here. This piece, in which arias behaved more like Broadway songs and orchestration as glossy as it is substantial, clearly belongs to the current blurring of lines between the traditionally considered domain of grand opera and the domain of musical theater, a distressing trend. From the first tuneful murmurings of the opera’s overture onward, with a musical vocabulary more akin to watered-down Leonard Bernstein and modern-day show tune-smithing than anything akin to John Adams, we know we’re in for an easy-does-it ride, harmonically. 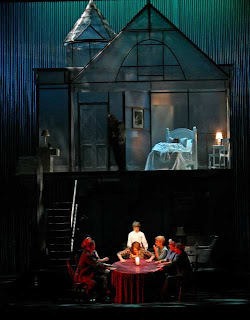 ... For his opera, much of the Schwartz-penned libretto yokes closely to the narrative and feel of the original but with significant differences, including a radical rewiring of the ending and a swapping of the film’s cool, almost Hitchcockian British air for a breezier, feelgood atmosphere in Schwartz’s retooling. Ironically, given this story’s emotional complexity and even supernatural perversity, the piece would seemingly benefit from stronger stuff in the compositional department. One could easily imagine a more tonally tense score, a la Alban Berg or even Benjamin Britten, doing greater justice to the story, whereas Schwartz’s musical patter seems precisely the wrong approach, trivializing the strange -- and strangely moving -- tale. To some degree, Séance is an opera for people who don’t like opera. Appearances of operatic tradition, including the requisite blend of love and death and liberal touches of the irrational, are intact but are presented in a too-soft, palatable musical package. Even so, Schwartz commands a sure skill with a tune and the arc of a dramatic evening. 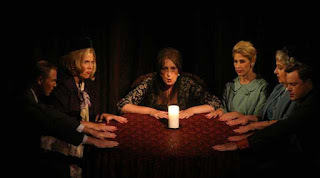 With an ultimately comforting charm, despite its wicked plot turns, Séance exists somewhere between Opera Lite and Opera Middling. That could win the opera populist favor and, by extension, that rare quality for new operas -- a shelf life. For more from the LA Times - including thoughts on conductor Valery Ryvkin's "steady, sturdy hand", read the full LA Times review here. Stephen Schwartz had a thought: "Wouldn't it be great if you could combine what the musical theater does with opera, to create a legitimate opera that also has tunes?" From the looks of the reviews- he did a bang-up job!